Should I Accept Downwards Odds Movement During Bet Placement? Should You Accept Downwards Odds Movement During Bet Placement? You’ve lined up a bet, it’s in your bet slip, but just as you go to submit your bet you receive an alert from the bookmaker site telling you that the odds have changed for the worse. Should you accept the lower odds after a bookmaker cuts the price? In this short post, we give you our thoughts and some numbers behind the decisions. If you’re placing a good ol’ fashioned regular punt, the decision to accept the new odds should depend entirely on the value you thought was in the bet in the first place. When you looked at the original odds, and perhaps your research if you’re the type to do that kind of thing, how much value did you think was in your selection? If you thought you were getting an unbelievable price based on your knowledge, and the new odds still reflect what you believe to be good value, then you should have no issue in accepting the lower price. However, bookmakers usually cut the odds because they realise they’re offering value and they usually cut them to a price that no longer does – not offering value is how they make money, after all. This doesn’t mean it’s impossible to still find value after the odds are cut. It just means it’s harder. The most important thing about this is when you’re eyeing up a price that you think provides some value, but not lots of value. If you’re eyeing up a price that you think should provide a small ROI over time but then the odds are cut, how low do they need to be cut before it’s no longer profitable long-term? Remember, it’s all about finding the right bet at the right price, and not just about picking a winner. If the price no longer offers value, don’t take the odds. It’s as simple as that. As a side note, if the odds increase in price, be sure to check that the situation hasn’t changed before blindly accepting the bet. Has a team suffered an important pre-match injury? Is the horse rearing up in the stalls? If it’s a matched bet you’re placing and the odds change, you have a couple of different things to consider. Firstly, were you already taking a large amount of value with your bet? For example, were you losing a tiny amount on your qualifying bet or making a huge return on your free bet? If so, it might be worth taking the lower odds to make your account profile look less suspicious. Had you already laid the bet before placing your bookmaker bet? We don’t recommend doing this, but if you had done so for some reason then you absolutely should accept the lower odds. Just update the calculator with the new price and accept the loss you’ll inevitably make. You don’t want to leave the bet running or be tempted to wait and inevitably end up losing even more. If you have no real reason to accept the lower odds, i.e. you weren’t taking excessive value and you weren’t in a rush to prevent making a loss, you should simply cancel the bet and re-use your oddsmatcher to find a new selection. There are times with certain offers that a reduction in price still provides a +EV bet. For example, you might find a ‘Double Delight, Hat-Trick Heaven (DDHH)’ bet at odds of 6.0 to back and 6.0 to lay. Let’s say that the player’s back odds get cut to 5.0. Because it’s general consensus that these bets are +EV up to qualifying losses of 20%, this price would still provide some value. The qualifying loss percentages for that odds match would be 16.66%, 18.06% and 20.16% at 0%, 2% and 5% commission respectively, so it still seems to provide some EV after the cut. 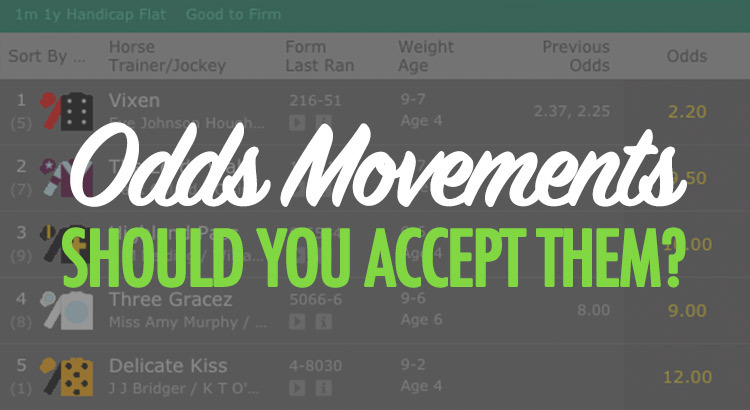 The general answer to whether you should accept lower odds in the case of an odds movement would be: no. However, this isn’t true in all circumstances. There are times when you can still find value after a reduction in price, both for regular bets (or ‘punts’) and matched bets. There are also other times that taking reduced prices could help to make your account look less suspicious and less likely to be restricted as a result. Free tips delivered straight to your inbox that we don't post ANYWHERE else.